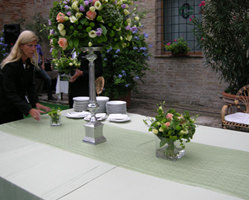 Corporate image of the wedding: Personalized invitations, the reception hall, decor, menu, firm seats, numbering tables. Control of the church: Printing and distribution of booklets on the benches of your prayers. Assistance and direction of your wedding. Service photo and video organization, confirmations and baptisms. Sacred music: gospel, soprano, harp, violin, flute, organ.